Whitebeam Chalets are excited to announce their latest offering in Peisey-Vallandry, Chalet Mélèze Sud, which boasts a new outdoor hot tub and sleeps up to 14 guests. Conveniently located in Peisey Village in south-eastern France, Whitebeams Chalets’ newest property is a 5-10 minute walk, or quick shuttle service, to the famous “Lobster Pots” (Lonzagne ski lift) which are free. Le Lonzagne transports guests from Peisey village up to the ski lift in Plan Peisey where there is instant access to La Plagne – on the Vanoise Express – or to the higher slopes using the Peisey lift. The Paradiski ski area near Chalet Mélèze Sud is made up of three ski resorts, Peisey-Vallandry, Les Arcs and La Plagne, which are linked by the the Vanoise Express double-decker cable car. Les Arcs, Peisey-Vallandry, and La Plagne ski resorts have 260 pistes covering 425 kilometres including beginners areas, off-piste skiing through trees, backcountry skiing, and a Snowpark with a water slide. Paradiski ski passes can be organised for guests of Chalet Mélèze Sud so they will be ready for them upon arrival, and ski lessons can be pre-booked through Whitebeam Chalets too. Paradiski resorts have restaurants and bars open for lunch, dinner, or drinks, including buffet-style restaurants, traditional cuisine, gourmet à la carte, and on-piste ski-in, ski-out bars, or guests of Chalet Mélèze Sud can have a packed lunch arranged with the chef to take with them up the slopes. Peisey-Vallandry is host to other winter activities such as guided tours of heritage sites near Vanoise National Park, horse sleigh rides, feeding reindeer, and snowshoeing. Owners of Whitebeam Chalets, Sarah and Matt, fell in love with Peisey-Vallandry where their tour of Europe, in their Volkswagen camper van, ended after they left their busy UK lives in Retail HR and Leisure. 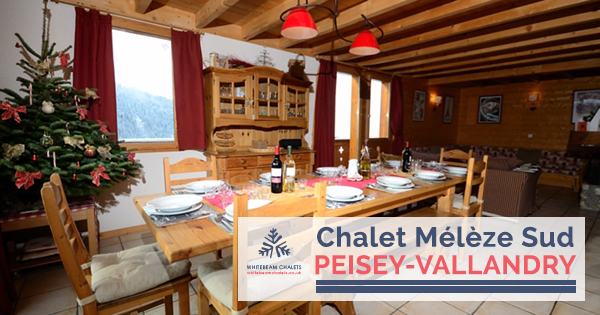 Now, after over 10 years running Whitebeams’ two catered chalets in the Peisey-Vallandry area Sarah and Matt say, “we’re excited to release a new chalet in the area we love”, and are already taking bookings for groups of up to 12-14 adults for their third chalet Mélèze Sud. As an independent, family ski company Whitebeams makes sure they provide guests a personal touch and wants visitors to their chalets to have the perfect holiday, whether it’s coming to ski as a family or as a group of friends. Chalet Mélèze Sud’s large south-facing terrace gets all-day sun making the perfect viewing deck for guests to take in the mountain valley scenery, and for guests arriving by car there is plenty of parking at the chalet. Other facilities of the chalet include full catering, underfloor heating, an open fireplace, entertainment system, ski and boot storage space, and free Wi-Fi. Catered meals are prepared for chalet guests by a personal chef six days of the week, and served with locally sourced French wine. Booking enquiries for Chalet Mélèze Sud can be emailed to [email protected]. Whitebeam Chalets tailor guests’ Peisey-Vallandry chalet holidays to their needs, and can also organise lift passes, ski lessons, transfers, babysitting services, yoga, massage, and provide information about the area.